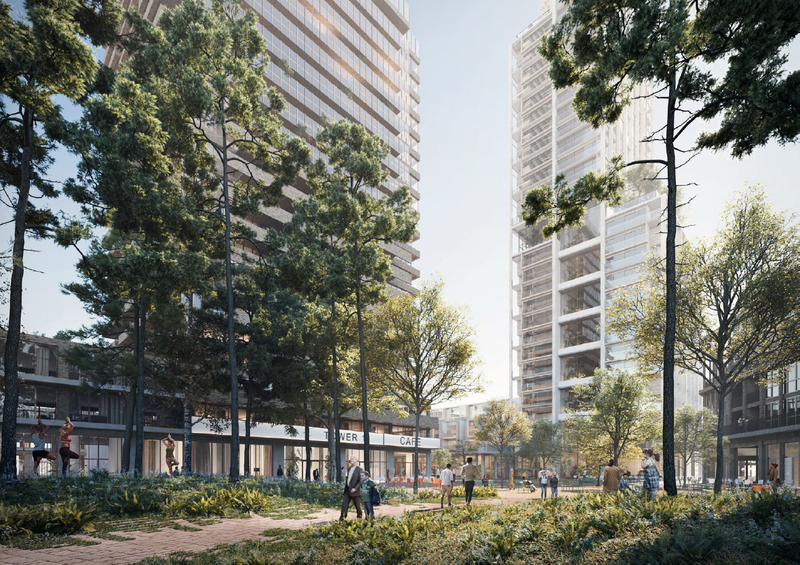 Karres en Brands is part of the consortium with real estate developer Stadswaarde, Koopmans Bouwgroep (TBI) and J.P. van Eesteren (TBI) and architects Architekten Cie. (Branimir Medic, lead architect), KCAP and Geurst & Schulze that has won the selection for the high-rise development next to the Leidsche Rijn station. 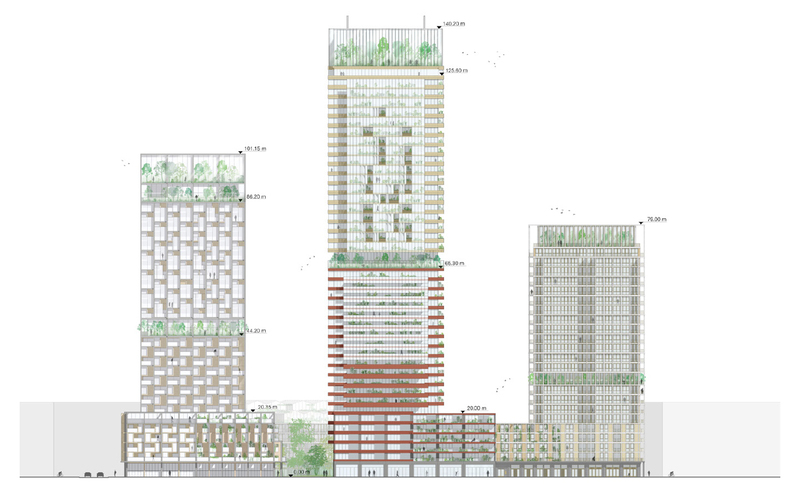 The consortium will develop three towers of 80, 100 and 140 metres high. Syntrus Achmea Real Estate & Finance is the anticipated investor for 886 homes. The project will include 1,128 residences in different sectors, approximately 60% social rent (279), medium-priced rent (278) and homes with care facilities (125). In addition, 204 private sector rent and approximately 242 owner-occupied homes will be built. 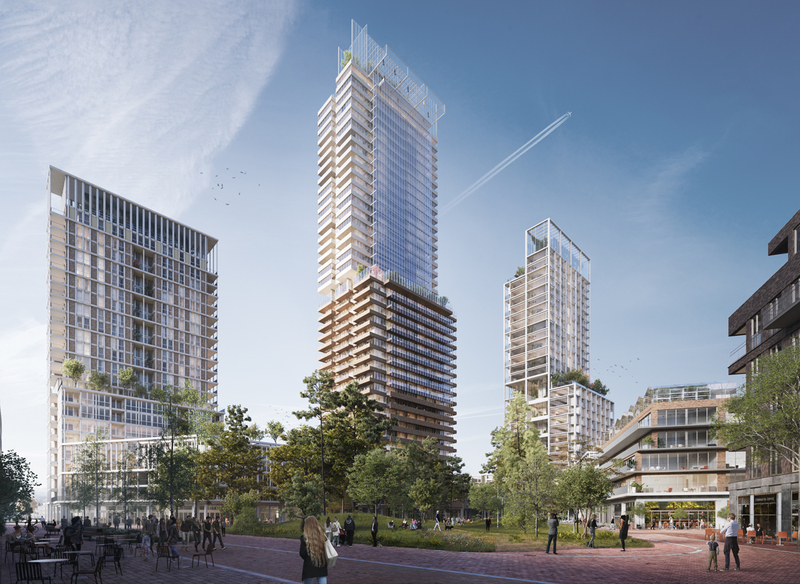 The overall vision of the consortium takes advantage of this unique opportunity for Utrecht to set a new standard in the approach on high-rise. High-rise is not a goal in itself, but needs to contribute to the dynamic of the city, the liveability on street level and provide an affordable, social and inclusive community with new mobility concepts within reach. 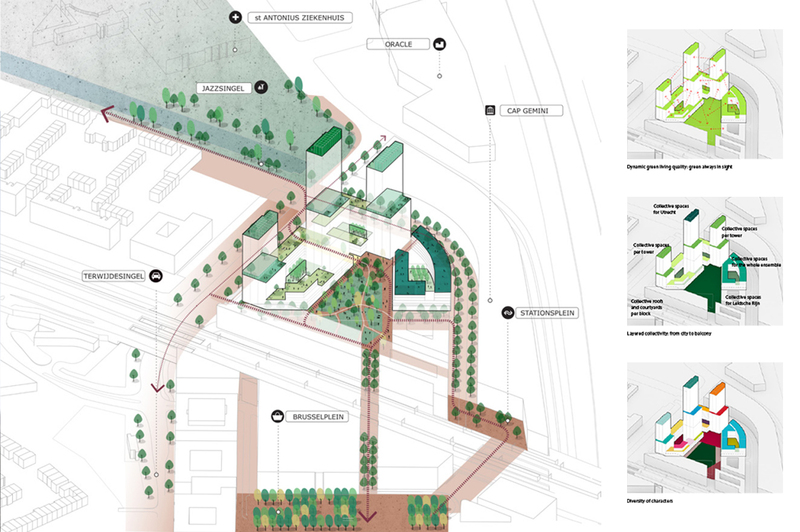 Karres en Brands developed the concept which literally elevates the landscape into the sky in the form of a vertical village, with an urban forest at its heart and urban agriculture integrated on every level. The history and specific living quality of Leidsche Rijn formed the inspiration for the entire design. 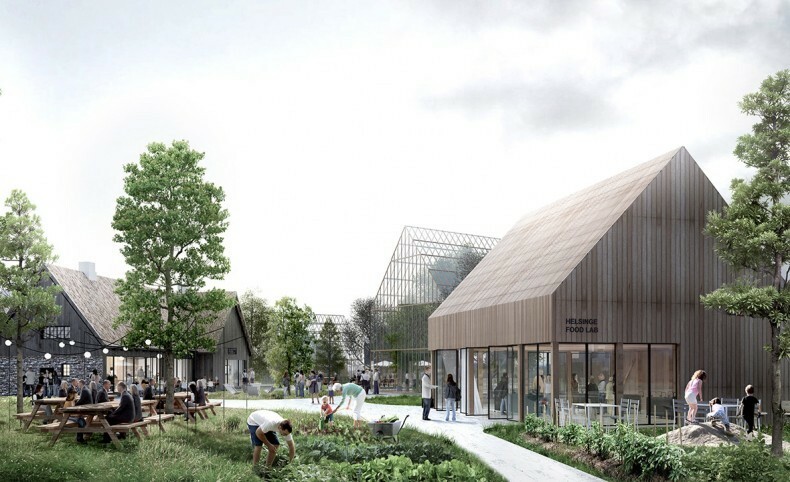 The project will include a high concentration of community spaces and spaces for collectivity such as rooftop restaurants, swimming pool, gym, communal laundry and kitchen facilities, shared visitor’s rooms, flexible work spots or makers’ ateliers for artists. An ambitious mobility concept will provide among other strategies a fleet of 100 shared cars for the future inhabitants. MARK consists of three towers, each with an illuminated ’crown’ that refers to the history of Leidsche Rijn as a horticultural area. The crowns and the lower roofs function as horticultural greenhouses, in which urban agriculture can be used on a considerable scale. Here, the future of food production is seamlessly integrated in the daily lives of the inhabitants. The project thus contributes to making the food chain in the city more sustainable. Local production of vegetables and crops for consumption by residents and local neighbourhoods. 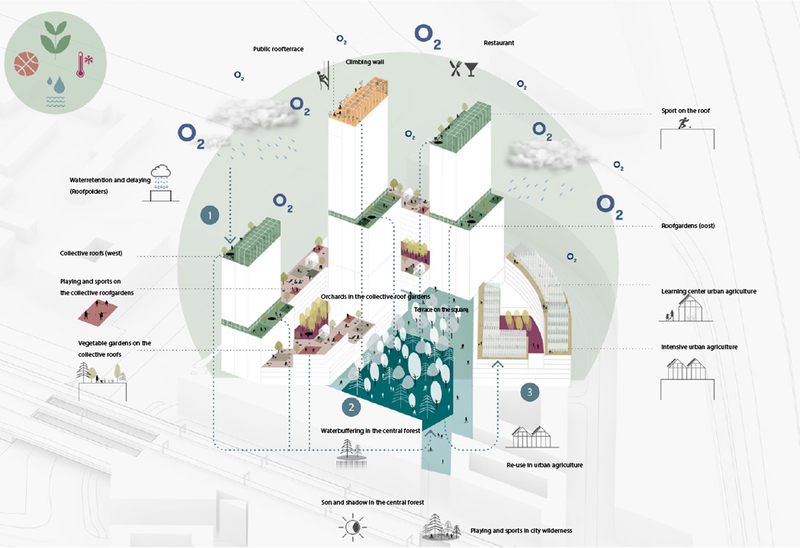 This short food chain has a negative CO₂ balance and at the same time guarantees a new biodiversity in the urban area. The homes will be delivered climate-neutral (EPC=0). MARK offers the inhabitants of Utrecht a striking building with a highlight in the form of a ’rooftop’ experience centre with restaurant and a glass balcony at 130 meters height. Restaurant and balcony are open to the public. For the further design of MARK, the consortium is already in discussion with various stakeholders, local groups and organisations. 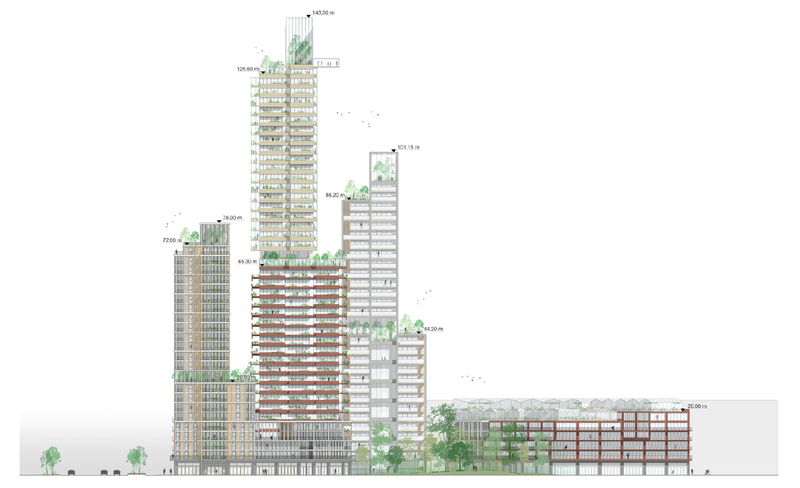 Close to the area, a high-rise lab will be set up and residents of Leidsche Rijn will be challenged to participate in various parts of the development. Completion of the project is planned for 2023.